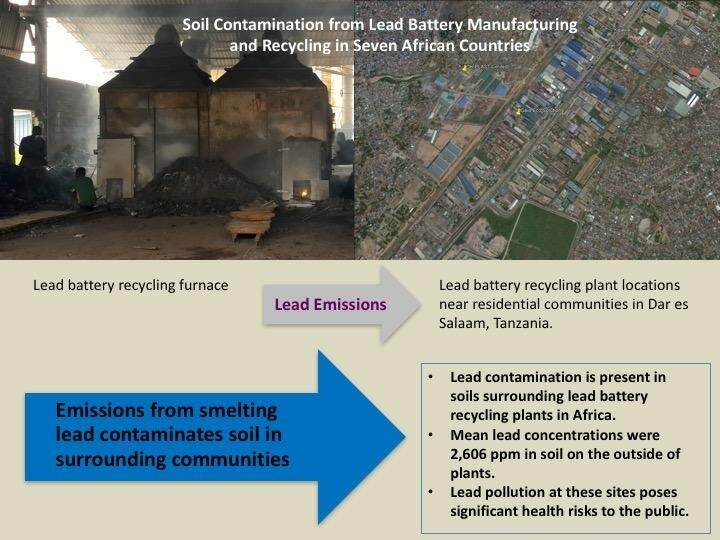 Extensive lead contamination was found in lead battery recycling plants and surrounding communities in seven African countries. The contamination levels in soil ranged up to 14% lead with average concentrations of 2% lead. Lead battery recycling is a growing hazardous industry throughout Africa. In addition to vehicle applications, lead batteries are used to store solar and wind power, and are in demand for backup power for computers, cell phone towers, and home use. Lead pollution at these industrial sites poses significant health risks to the public. The study "Soil Contamination from Lead Battery Manufacturing and Recycling in Seven African Countries" published in the Journal Environmental Research, tested areas surrounding 16 authorized industrial facilities in Cameroon, Ghana, Kenya, Mozambique, Nigeria, Tanzania, and Tunisia. Lead levels around lead battery recycling plants ranged up to 48,000 parts per million (ppm) with an average of 2,600 ppm. Levels below 80 ppm are considered safe for children. Perry Gottesfeld, Executive Director of Occupational Knowledge International and the lead author of the study, said "There is an immediate need to limit lead emissions from this industry and to test children's exposure levels in nearby communities." He added that most African countries have no laboratories that can routinely test blood lead levels. "This study demonstrates that even large scale recycling facilities are significant sources of lead contamination." Gottesfeld said. Even in Los Angeles, California the large Exide Technologies battery recycling plant that was forced to close in 2015 was found to be contaminating soil in a radius extending up to 1.7 miles from the site. "In Africa there are no industry specific regulations controlling the release of lead from these recycling plants or to protect workers and children in surrounding communities." said Dr. Gilbert Kuepouo, from the NGO CREPD and an author on the study. Kuepouo noted that "One of the two facilities tested in Cameroon is located within approximately 100 meters of a High School and residential district with 30,000 inhabitants." A recent study found that lead exposure levels among children in Cameroon are five times higher than those reported among children in France and six times higher than in the U.S. "We know that exposures around these industrial facilities are much greater than the levels we saw in our capital city, Yaoundé." Kuepouo added. Few countries in Africa have adequate regulations governing the operations and emissions from lead battery recycling. Kuepouo added "That governments should require lead battery manufacturing and recycling industries to publicly disclose their air emissions on an annual basis like in Europe and the U.S."
The authors of the study called on governments to ensure that plant operators set aside funds for facility closures to ensure that lead soil contamination is no left behind. One such site around a shuttered lead battery recycling plant in Mombasa Kenya that has never been remediated is responsible for poisoning hundreds of nearby residents since the plant was closed in 2009. The United Nations Environment Assembly (UNEA) adopted a resolution during its meeting in 2017 calling on governments to do more to control hazardous lead emissions from lead battery recycling.